I recently did a series of posts on the American Southwest. As a final entry in that series, I wanted to tell my story of obtaining photography permits from the Navajo Nation. Sometime in the past, I’m not exactly sure when or how, I learned that photo permits are required for commercial photography in Navajo Parks. So when I started planning for my trip that was to include visits to three Navajo parks: Monument Valley, Canyon de Chelly, and Antelope Canyon, I started an internet search to determine if a permit was truly needed, and if so, what was the cost. My whole experience turned out to be an adventure in bureaucracy. It is important to remember that all officially recognized Indian reservations in the United States are recognized by the federal government as “domestic dependent nations.” This status allows each tribe to independently have its own laws and regulations. I am quite familiar with this. Here in Washington State, there are 29 federally recognized Tribal nations. Three tribes are good clients of the environmental company I run for my day job, Robinson Noble, and several others we work for on an occasional basis. Working with Tribal nations on a regular basis, I was inclined to pay for a permit for the Navajos. Little did I know, however, how involved the process would be. One of the first things I learned in my internet search is that most photographers do not get permits. They are only required for commercial photography, and many landscape photographers don’t bother because of lack of enforcement and cost. If you are not planning on selling any photography from the parks, you do not need a permit. Chances are you will not see any Navajo rangers or police, but if you do, you may be asked to show your permit if you have expensive looking equipment even if not shooting commercially. And, of course, there is the question of what is commercial. You may not consider yourself as a commercial photographer if you only sell an occasional fine-art print, but based on my dealings with the Navajo Parks Department, they would consider you as one. On their website, on the Monument Valley page, not on the main permits page like you might expect, it states permits are required for “filming and photography undertaken for commercial purposes, i.e. for financial gain or public display and exhibition.” If you have any intent to possibly sell images taken in a Navajo park, legally you need a permit. I also learned that finding the exact rules for photography in Navajo parks is next to impossible. The Navajo Parks website is not very useful. If you go their website, there is a top menu link to “Permits and Services,” and hitting that link takes you to a page that largely talks about hiking and camping (permits also needed). However, on the side menu, there is a link titled “Filming and Photography Permit for Tribal Park Area.” This link does take you to a permit form, but it is for filming, not still photography. There is a separate permit form for still photography. I only found this application form by doing a Google search for “Navajo photography permit” not through their website. While researching for this post, I did actually find links to the still photography permit. There are links on some of the individual park pages, not at the main permits page. If you look at the two permit forms, you will notice that the still photography form is much simpler (which is nice), but you will also notice that it does not specify what the fees are like the filming form does. After some searching, I found this page on the Navajo Parks website that discusses fees for both still and video photography, though that page is also unclear as to what fees apply only to videography vs still photograph. However, based on that fee list, I determined that there a fee of $10 per day per person and a $50 processing fee. It seemed fairly reasonable. Consequently, I prepared an application, selecting the three full days I planned to photograph in Monument Valley, at Canyon de Chelly, and in Antelope Canyon (which is in the Lake Powell Navajo Tribal Park). At the time, I assumed that one processing fee was required no matter how many parks were visited, but then I re-considered the statement at the top of the application which says, “Submit application and applicable fees to the address at each location photography is to take place.” Did that mean, I asked myself, that I needed to send three separate applications, each with the $50 processing fee? Suddenly, the fees seemed less reasonable. Consequently, I filled out three applications and sent them in to the three parks, each with a $60 check to cover the processing fees plus one day photographing in each park. About a week later, I received a phone call from the Lake Powell Navajo Park. They said my application had been received, however, they do not accept personal checks. Instead, I would need to send a money order or cashiers check, and it should be for $50, not the $60 I’d sent. The daily fee was only $8, not $10, and should be paid when arriving. Further, on the application, I needed to not only state the day I would be photographing, but the hours I’d be there and the name of the tour operator I would be using (visits to Antelope Canyon and other slot canyons on the Navajo Reservation require a tour guide for non-Navajos). So my next step was to set up reservations with a tour operator for visiting Antelope Canyon. After researching the various Antelope Canyon tour operators and didn’t see much difference between them in terms of price or service. All offered a photo tour, where tripods are allowed, for about $80 or a standard tour for about $30. The photo tours were all about 1/2 longer. The number of people per tour are all large, and the photo tours occur concurrently with the standard tours, so at any time there could be hundreds of people in the slot canyon. It sounds like a really zoo, but I’d never been there, so though I was tempted to forget the whole thing, I decide I need to go at least once. I eventually chose Antelope Canyon Navajo Tours solely because they are located at the entrance to the canyon, not in Page like the others. I chose them because I wanted to do Lower Antelope Canyon in the early morning, then Upper Antelope Canyon later the same morning. I called them to see if I could book Tanya on the photo tour, so we could tour together, even though she would not have a camera. The answer was no, only photographers are allowed on the photo tour because allowing non-photographing spouses on the tour would deny some worthy photographer of a spot. They said to book Tanya on a standard tours, and she would have to wait a half hour after her tour ended for me to come out. I went ahead and booked us on separate tours. Luckily, they did not require a deposit. Then I investigated Kens Tours, which is the only company that does lower Antelope Canyon tours. Photo “tours” there $50. There is no tour involved, you get a pass that allows you in the slot canyon by yourself for 2 hours. Again, non-photographer spouses must go on a standard tour ($28, one hour long). Reservations are not required. Now armed with a reservation for Upper Antelope and a plan for Lower Antelope, I filled out a new photo permit application, bought a money order for $50, and sent if off again. Now, several days after the call from the Lake Powell Navajo Park, I was beginning to wonder about Monument Valley and Canyon de Chelly. Did they also not accept personal checks? Would they need specific times? I was starting to get a bit worried about timing, this was only a couple of weeks before we were to leave on our trip. Them: Yes, cashier’s checks or money orders only. You said your name is Joe Becker? Them: Oh, yes, we received your application. I’ve sent it down to Window Rock for processing. Me: You cashed it? I thought you didn’t accept personal checks? Them: We don’t. You’re check’s not going to bounce is it? I’ll be in trouble if you don’t have any money in the bank. Me: No it’s fine. I have plenty of money in the bank. But, I’m a bit confused. You cashed my check, so I don’t need to send a money order? Instead, I called Canyon de Chelly. The phone call was answered by someone at the campground, which I thought was a bit odd. I asked about the application and whether personal checks were okay. They told me to call the main Park’s office in Window Rock, and I should call the National Park Service, they’d want a permit as well (Canyon de Chelly is co-managed by the Park Service and Navajo Parks). I know the rules for national parks and knew I didn’t need a permit. About a week later, I received my permit in the mail for Lake Powell Navajo Park (Antelope Canyon), and several days later received an email with a pdf copy of my permit for Canyon de Chelly. But nothing showed up for Monument Valley. Finally, just a couple of days before I was to leave on my trip, I emailed “Jane” at Window Rock, saying I was leaving in two days and asking about the status of my application. She emailed me back the next day, asking if I had submitted an application, saying my name was not familiar, and if not, email one to her as quick as possible. I immediately emailed back with the story of my application, about how I had talked to the Monument Valley office, and that they told me my check had been cashed. But in case she still couldn’t find my application, I attached a new one with the email. I also attached a pdf of the cancelled check. She responded four days later. By this time, I was camping in Arches National Park with plans to drive to Monument Valley the next day, and I had little hope of getting a permit. However, around lunchtime we drove into Moab so I could again check my email. Sitting on a nice shady bench outside the visitor center, using their free WiFi, I finally found a response from Jane. In the email she said the check I had previously sent had been shredded, so I would have to pay the fee once I got to Monument Valley. Attached was an invoice for $70 ($20 entrance fee and the $50 processing fee). Also attached was the permit. So obviously there was some confusion, but at least I had the permit, though it was unsigned. We drove to Monument Valley the next day, arriving late in the afternoon. The park office was closed. The following day, the day my permit was good for, I got up early and took sunrise photos. Tanya and I then drove the scenic drive, where I took more photos. Around noon, we drove back to the hotel and visitor center. The park office was open. I talked to the same woman I had talked to on the phone (the one who had cashed the check) several weeks before. She had no memory of the phone call or of cashing the check. She did have a copy of my permit and wanted payment. I gave her the whole story, and showed her a pdf copy of the cancelled check on my smart phone. She accepted that as proof, and officially signed the permit. Canyon de Chelly – the permit is simply a copy of my application signed the park manager with an attached receipt for the payment. Monument Valley – the permit is a single page of Navajo Parks letterhead, signed both by me and a park official, allowing photography on September 4, 2014 subject to 17 different conditions, five of which were marked as not applicable. One of the non-applicable conditions was the requirement to have a certificate of liability insurance naming the Navajo Nation and the Monument Valley Navajo Tribal Park as additional insureds. Lake Powell Navajo Park – the permit is four pages long. The first page gives the date of the permit as September 8, 2014, the times of my scheduled Upper and Lower Antelope Canyon tours, states an $8 balance was due (the entrance fee), and says liability insurance is required. The second page was signed by the park manager and includes the statement that any photography that exceeds 8 hours will be considered as part of an extra day. The final two pages are a listing of 24 extra conditions, including the need to have the Navajo Nation as an additional insured on my general liability insurance policy. After this whole adventure in Navajo permits, how did the photography turn out? I’m very happy with my results from Monument Valley. My favorite shots from Canyon de Chelly were taken from the rim, where I doubt a permit is actually needed. However, I do have a few good images from inside the canyon were a permit is definitely required (at least if you follow the rules). And Antelope Canyon? We ended up not going. It rained on the day of my permit, and I thought that exploring a slot canyon in rain was a foolish thing to do. Though I do have some good images from the trip, I doubt I will ever earn my permit fees back in image sales or licensing. But if I do, I will do so legally. If you are photographing commercially, including just having the intent to possibly sell a fine art photograph, you legally need the permit. Each application requires a $50 processing fee, payable with a cashiers check or money order (personal checks are not accepted). It’s best to send your applications in at least a month prior to your trip. The canyon just downstream from Umtanum. Often when traveling, particularly via Interstate highway, I look for scenic byways that parallel my path. Places with scenery, where a few good photos can be taken, without going far out of my way. Washington State Route 821 through the Yakima River Canyon is such a route. If you are traveling on Interstate 82 between Ellensburg and Yakima, Washington (basically on the main route from Seattle to eastern Oregon, southern Idaho and Utah), it is worth taking the few extra minutes to travel this road. The road add about 15 minutes drive time, but less than 5 miles to the route. Of course, if you are tempted to get out and take a few photographs, go on a hike, or view wildlife, it may add much more than a quarter-hour to your trip. If traveling south from Ellensburg toward Yakima, to reach this scenic byway, you can take the Exit 109 (signed Canyon Road, Ellensburg) and turn left onto Canyon Road at the bottom of the off ramp, or take Exit 3 on Interstate 82 (signed 821 South, Thrall Road) and turn right on Thrall Road at the end of the off ramp, then left onto Canyon Road. Once on Canyon Road, within several miles, you will be driving a 25-mile long, twisting two-lane highway that follows along the eastern shore of the Yakima River. 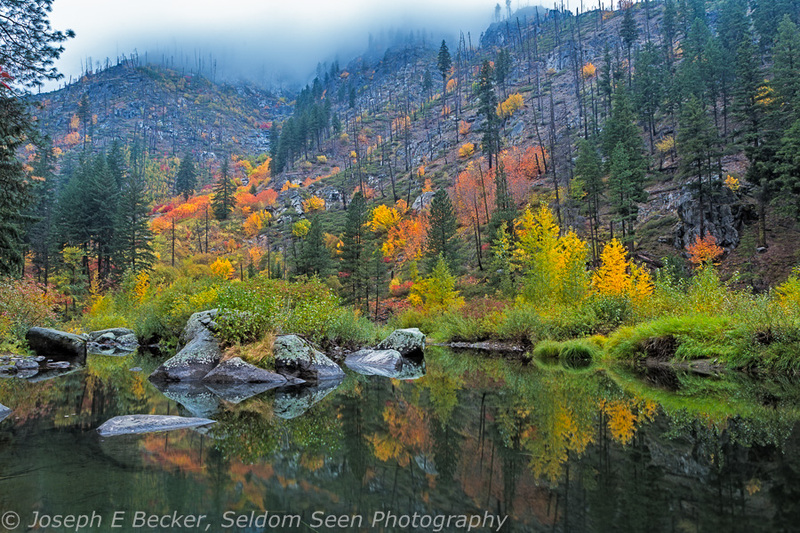 The river forms an oasis in the otherwise dry foothills on the east side of the Cascade Mountains. In the summer, lush pockets of green contrast with the dryland hills and cliffs above the river. In the spring, when the hills can be green, the contrast is between trees denser foliage along the river and the mostly grass and scrub brush on the hills. 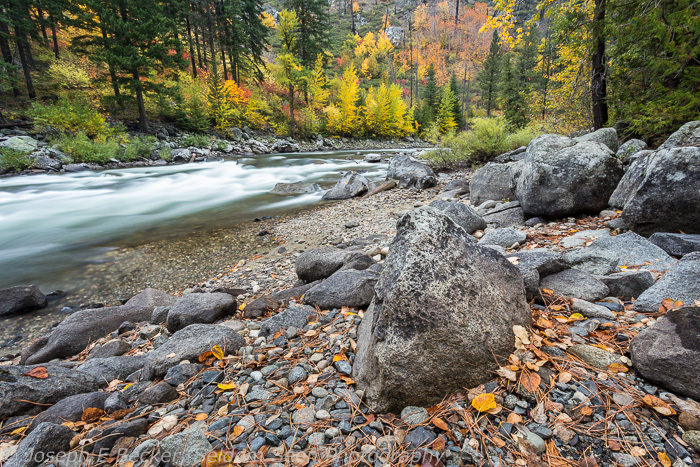 In fall, the riverside foliage, including a mix of cottonwoods, aspens and evergreen conifers, presents a contrasting yellows, reds and oranges. In winter, there is often snow along the river and in the hills. Whenever you visit, on this side of the Cascades, the weather is often sunny and the sky blue (no promises though!). There are four recreation areas run by the US Bureau of Land Management (BLM). These offer places to stop with camping spots, picnic tables, and vault toilets. They also have boat launches, which present an additional way to enjoy the canyon – by boat, canoe or kayak. The river is calm throughout the canyon, but if you do boat the river, be sure to use the take out at the Roza Recreation Area to avoid the Roza Dam that is shortly downriver (above Roza, only non-motorized boats are allowed) . The first recreation area heading south on the road, Umtanum, is particularly worth a stop. Here a suspension bridge spans the river, leading to a fine hike up Umtanum Creek. The hike leads through Untanum Canyon, away from the river, and into the pristine wildlands of the Wenas Wildlife Area . The recreation areas have a $5/vehicle daily use fee (or use an Interagency, ie National Parks, pass). Away from the recreation areas, there are plenty of pull overs along the road to practice photography or look for wildlife. Mule deer, elk, and bighorn sheep, as well as eagles, hawks, falcons and other birds frequent the area. Also be aware, that in spring and summer, rattlesnakes are also common. Most of the photos illustrating this post were from my recent trip through the canyon earlier this month. The last several are from earlier trips. Several miles downstream of Umtanum. Contrasting cottonwoods and bare hills. The river is lowest in the fall and winter. In summer, flows are the highest due to upstream dams in the Cascades letting water out to be used for irrigation downstream in the Yakima Valley. Another typical scene along the Yakima River. Sunset on the hills above Highway 821. On one trip through the canyon, we easily spotted this unusually marked mule deer and its companions. Sunset at the southern end of the canyon, near the small town of Selah. Earlier this week Nahla, Tanya and I ventured out on Veteran’s Day in search of some the last fall colors of the season. Two weeks earlier, my friend and fellow photographer Bob Miller visited me in Tacoma. He asked for suggestions of photographic side roads he could visit on his drive home to Arizona. I suggested the Yakima Canyon Road, also known as State Route 821. Bob posted some great photos from the drive on Facebook. 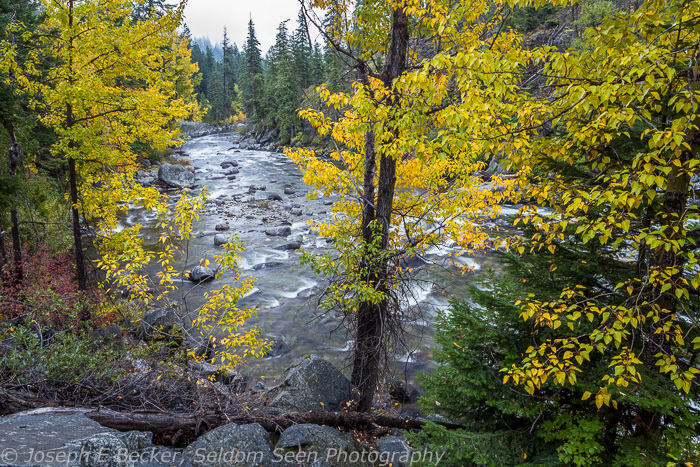 I was particularly taken with one of his shots, taken from the suspension bridge over the Yakima River leading to the trail up Umtanum Creek. A year and a half ago, Tanya, Carson and I hiked this trail, and one of my favorite photos of Tanya (and Carson) was taken on this bridge. Because of Bob’s shot, I decided we should try the same road. Bob definitely had better color than we did, but it was worth the drive anyway. The day was cold and windy, but sunny. I came away with some good shots, and may post more of them later. But today, I want to feature the one I took from the bridge, just to show Bob what a difference two weeks makes. By the way, though it looks fairly warm in this photo, it was near freezing with the wind blowing about 20 mph. Brr! 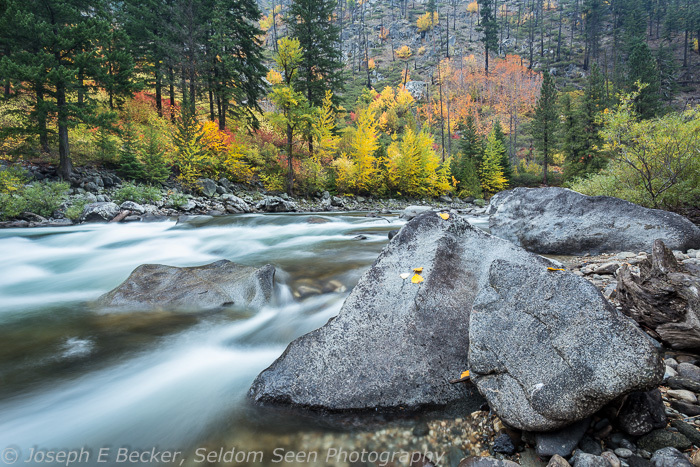 While doing my series of posts about the Southwest, I did manage to get out one Saturday in October to hunt for autumn colors here in Washington State. As I’ve mentioned before, fall colors are not the best in the Evergreen State, but they can be found if you know where to look. Timing is also important, as they don’t last long and snow can come to the higher elevations unexpectedly anytime in October. That was the case two years ago when a few days after taking fall color shots at Mount Baker, a snowstorm hit and the area was snow-covered until spring. 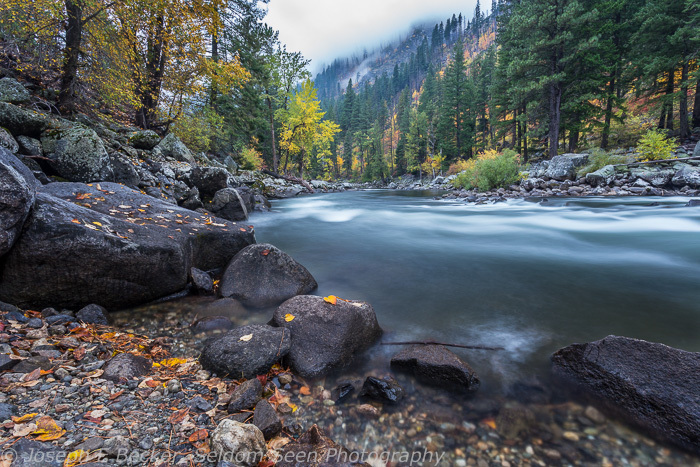 This year, we headed over to Leavenworth, Washington a couple of weekends ago. I was accompanied by Tanya, her mother Maxine, and Nahla. Leavenworth was crowded, as it was the last day of their annual Octoberfest. It took us about 20 minutes to go the last 2 miles into town, and another 10 minutes to find a parking spot. But I was there for the color, not the beer and brats (though I did have beer and brats while there, how could I not?). After lunch, I left Tanya and Maxine in town and Nahla and I headed up Icicle Creek, just west of town, into the Okanogan-Wenatchee National Forest. The color wasn’t too bad. I stopped at four or five places and got a few good shots. After Icicle Creek, I picked up the girls and we drove up Highway 2 along the Wenatchee River as it winds through Tumwater Canyon. The color, I thought, was much better here, and I wished I had more time. However, it was already late and the sun set early this time of year. I shot until it got dark, and was quite happy with the results.The shot above is one of my favorites from the trip, shot at the very end of the day. 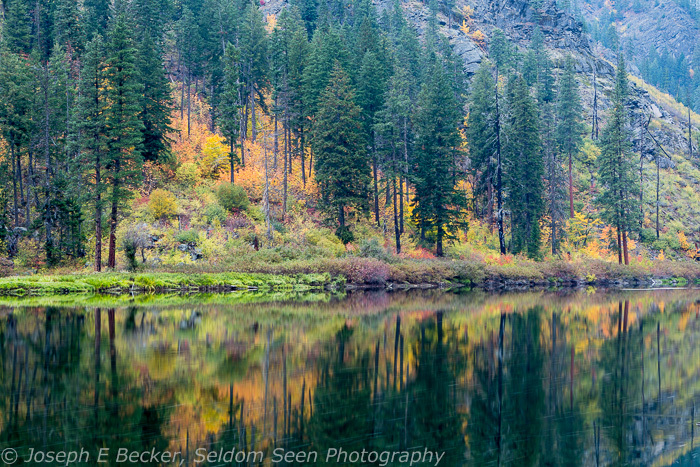 It was shot on a tripod at ISO 200 and f11 for 30 seconds with a circular polarizer (actually it is two merged shots, one with the polarizer set for the water and the other with it set for the foliage). 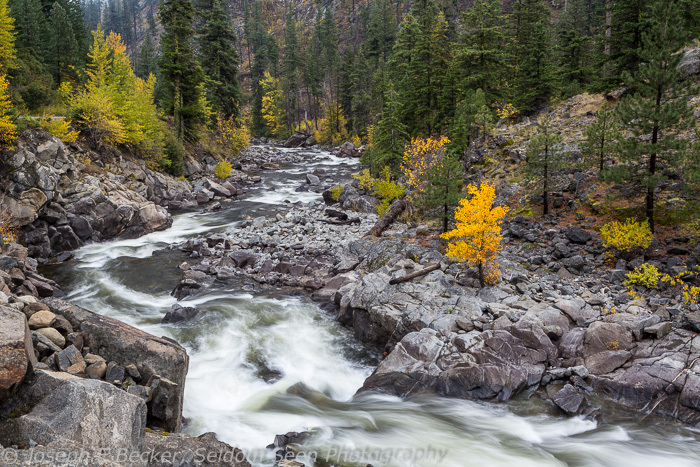 It’s probably too late now to catch much color there, but come next October, you may want to try Tumwater Canyon and Icicle Creek. Just remember, if you go during Octoberfest, you may need a little extra time to get through Leavenworth. 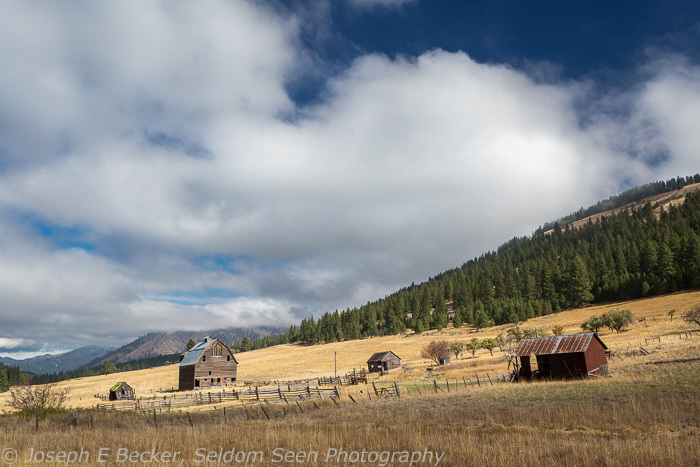 We stopped briefly on the way to Leavenworth, south of Blewett Pass, to photograph this old barn.